Discussion in 'Shoes, Shoes, Shoes' started by slightlyremoved, Apr 9, 2009. Are they one the comeback again? Yeah, I think they're always 'in'. Classics. on a lot of men they tread a fine line between classy and looking like a fashion-victimy ponce - never a good look for a gentleman. is there another photo of them? 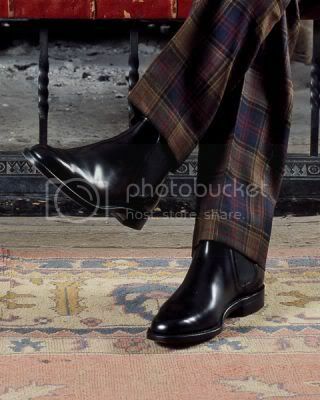 i cant really tell what shoes they are..it looks like oxfords pictured up there.. They look best on guys. I have seen many a guy come close to tripping over himself in them though.. rather funny at a distance! When they work though they look de-lovely. I've got some and I love them. They're great in the winter. 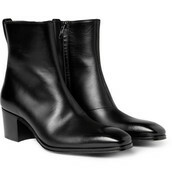 i live in LA and i've been looking for some chelsea boots for men. Does anyone know a place where i can get them? Ive been wearing Chelsea boots solidly for about 3 years now. its all I wear, even in the evening. I recently bought these beauties from Agnes b. They come in an array of different Neon colours so not sure which one to invest in? ooh i LOVE the agnes b ones Kite! I too have worn my pair of chelsea boots almost completely out. I'm on the hunt for a new pair. Ideally, i'd like to buy a dressier pair for evening....and then replace my current beat-up pair for day/work. There is really almost nothing they don't go with. i have these sam edelmans in moss green, i love them, and bought them twice just cause it's so hard to get a good chelsea-ish boot for girls. I really want a pair.. I'm looking for something similar to these... (just a bit more affordable..) Any recommendations?